With Key to Change—serving South King County—Morris pays forward generosity he received as a youth. For Seattle University’s Quinton Morris, one of two tenured African-American violin professors in the United States, the violin is both an instrument and a seed. 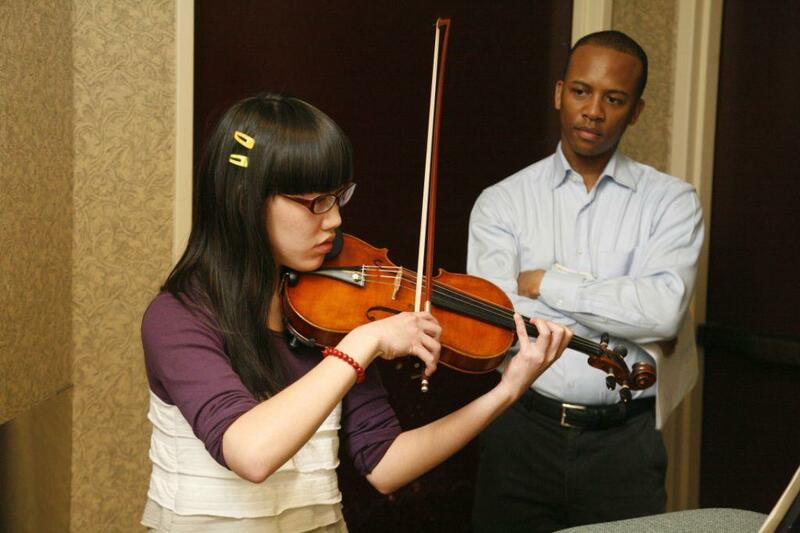 And with it Morris is growing a great forest—his most recent plot being south of Seattle, where he’s founded Key to Change, a violin studio with branches in Renton and Maple Valley for students of color with limited financial resources. The studio’s origins began way back in the ’90s, when Hank Linear, then president of the Renton Black Parents Association, saw Morris had talent. Linear, through his organization, made it possible for Morris to attend college tuition-free and bought him his first violin. Now Morris wants to pay that generosity forward. And the virtuoso has a lot to offer. Morris is a filmmaker and entrepreneur who this year toured nearly two dozen cities, from Asia to Africa, to perform, lecture, and screen his latest project, Breakthrough, a short film about the 18th-century violinist and composer Chevalier de Saint-Georges. Key to Change, now accepting applications for lessons starting in November, aims to provide access to world-class private instruction to some 25 middle- and high-school students in South King County. Students will also participate in master classes taught by guest artists and attend workshops on the audition process, solo and ensemble preparation, and the college application process. Read the full story in Seattle Weekly here. Quinton Morris is a violin virtuoso who wants to give back. The Seattle University teacher grew up in Renton and fondly remembers the support he got from the community. He says that encouragement is important for people of color who want to be classical musicians. Morris told Jamala Henderson how he was often discouraged. Read the full story on KUOW here. When Dr. Quinton Morris plays his violin for an audience, there’s no doubt he’s connected to the instrument. With his eyes closed, right hand on the bow, Morris seamlessly strings notes together creating a beautiful sound. The two are a fine-tuned team. Morris has performed on stages across the world and teaches at Seattle University. In January, he is bringing his talents to a new audience in South King County. Morris is opening Key to Change Studio, a music studio where he will teach middle and high school students violin in Renton and Maple Valley. The studio is open to everyone, but Morris is focused on students of color. The students who enroll in his classes will also work with Morris’ Seattle U students who will act as peer mentors, perform in quarterly recitals and attend workshops on the college application process. The school is currently accepting applications. Morris’ schedule is full of activity. He says he works when everyone else is sleeping. He’s done a TEDx talk on artist entrepreneurship, performed in front of sold-out crowds at Carnegie Hall three times and received numerous awards and accolades. Morris began playing the violin in the third grade when he was just 8 years old. At the time, all of his classmates played an instrument. In the coming years, his mother encouraged him to keep playing because she believed the violin would open doors for him. His mother’s words of encouragement became a self-fulfilling prophecy. In September, Morris wrapped up a world tour called “Breakthrough,” which took him around the globe to play for audiences in Australia, Malaysia and Tanzania, just to name a few. While flying to different countries, he still maintained his teaching responsibilities at Seattle University and got married. Morris described the experience of traveling the world as incredible. He was able to interact with people from different cultures he normally wouldn’t encounter. The concerts he performed were innovative in that he shared classical music with each audience in a nontraditional way. Morris performed, lectured and showed a film at the end. He played the role of Chevalier de Saint-Georges in the film Morris and a crew shot at the Louvre and Versailles castle to tell the composer’s story. In addition to performing in venues, Morris also celebrated 20 years of being cancer-free while on tour. He found out he had cancer shortly after turning 18. In November, he received the Young Arts Leader award from Gov. Jay Inslee. During the Arts and Heritage awards ceremony Morris played “Melodie” by Gluck. Then, with the help of a DJ, he transitioned into a hip-hop medley of songs by Beyoncé, Rihanna and Drake. Hearing R&B, pop and hip-hop on a violin is an unforgettable experience. Morris said it was a throwback to his days as a member and artistic director of Young Eight, a string octet of Black artists. Morris credits his success with knowing who he is and what he has to offer. RENTON, Wash. – Even at a young age, Quinton Morris knew he was destined for greatness. “I always knew the world was my oyster, and as cliché as that sounds, there was always this little voice inside of me,” Morris said. That little voice told him nearly 30-years ago to pick up the violin. “Or maybe the violin picked me, I don’t know,” Morris said. As a young African-American growing up in Renton, he thanks his college professor for recognizing his talents. Morris is now considered a virtuoso on the violin. As a professional artist, he has played with the best symphonies and sold out Carnegie Hall three times as a soloist. This past year, Morris embarked on a 9-month World Tour. He performed in France, Malaysia and Guadeloupe. He also shot a short film and introduced his passion to underprivileged kids. Today, Morris who is a tenured professor at Seattle University, not only wants to teach at the highest level, but he also wants to return to his roots where he believes is needed. “It is needed everywhere, but it is really needed in King County,” Morris said. At the end of this month, he will open two violin studios at community centers in Renton and Maple Valley, part of his Key to Change Project. “It is needed because there are not a lot of people who look like me, who are African-American, who are a person of color, who play a European instrument,” Morris said. “Exposure is everything, because now they are able to say, there is somebody that looks like me and I could aspire to be like that too. To help promote his foundation and studios, Morris will hold a concert this Saturday at the Ikea Performing Arts Center in Renton. The event begins at 7:30 p.m. and is free to the public. Learn more about Morris and his music here.